We have teamed up with renowned sound designer eXode to elevate our game to the next level. eXode, maker of top selling refills, knows synthesis and sound design backwards and forwards. We know DSP and the Rack Extension SDK inside and out. It’s a perfect team to bring you something big. Together we have crafted a new synth that pushes the Rack Extension platform to its ultimate potential. Introducing Expanse Hyperwave Synthesizer. 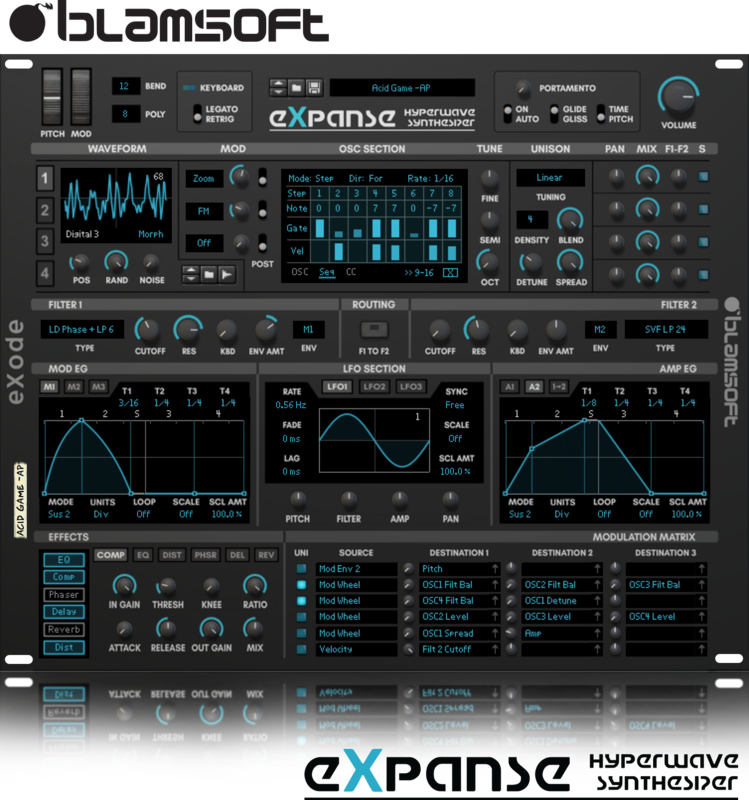 Expanse is a modern wavetable synthesizer with 67 high quality wavetables designed by eXode, and support for all Serum-compatible wavetables. But that is just the beginning. Advanced waveshaping, additive, and unison capabilities allow you to create thick sounds with just one oscillator. And there are three more where that came from, for sounds that are utterly enormous. Want more filters? Expanse has 32 filter modes in each of the two filters including the most famous topologies. In the modulation department, Expanse’s three LFOs offer 64 unique waveforms and the five graphical envelopes have a slick user interface and looping features. Six onboard effects let you stay “in the box” and allow for factory presets that are polished to perfection. 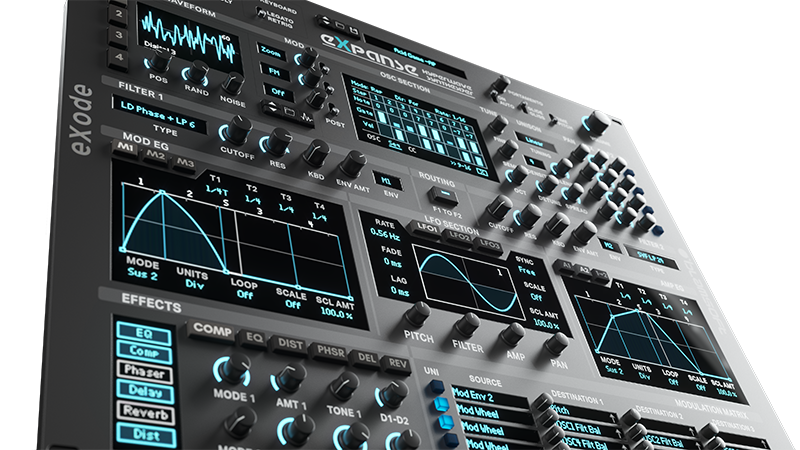 To top it all off, Expanse features two sequencers that let you easily create gate and note or modulation patterns. The extensive factory sound bank for Expanse was designed by leading Reason sound designers. Speo, Aiyn Zahev, eXode, Tom Pritchard, and Navi Retlav Studio all contribute their creative touch. The 775 included presets range from cutting edge EDM, to 80s new wave, to classic analog, and plenty in between. Whether you’re looking for inspiration, trying to find the right sound, or wanting something to tweak beyond recognition, there is a good chance you will find it here. Choose from Plucks, lush pads, gritty bass, trance sequences, and plenty of epic leads to name a few. The DSP algorithms in Expanse are industry leading, resulting in a rich, smooth tone. You would be hard pressed to find any audible aliasing in Expanse, the waveshaping algorithms are literally alias-free. We dare you to compare that to other synths you have. The filters in Expanse are Zero Delay Feedback for ultimate analog realism. You can dial in quality vs CPU usage using switches on the back. All of this creates a sad situation, your previous favorite synthesizer will now cry while collecting virtual dust as you gleefully play with Expanse. Such is life. Expanse is not merely another synth to add to your collection, it is destined to become a part of your personal workflow. You will find that things you were working hard to do with other synths come more easily with Expanse. For example, just click and drag to connect destinations in the mod matrix. The graphical envelopes and waveform display give you instant visual feedback. Expanse is fully equipped with the workflow enhancements enabled by SDK 2.5, including popup sub-groups and modifier key support. In version 2.0, wavetables in Expanse became a whole lot more powerful. You can load any Serum-compatible wavetable into Expanse. With literally thousands of Serum Wavetables available, the number of options is incredible. In addition to Serum-compatible files, Expanse will process any sample and extract a wavetable. This leads to quick creative experimentation. You can even go deeper with the import algorithm to accurately sample an oscillator from your favorite synth. 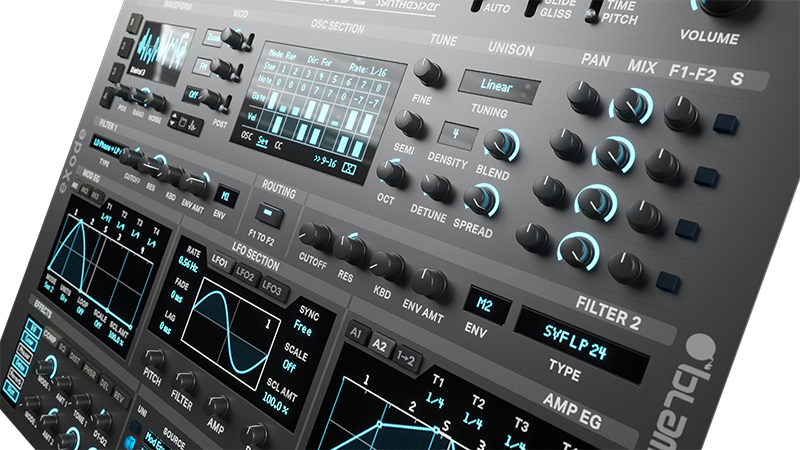 In version 3.0, more great enhancements were added to the synth. The envelopes feature a powerful editor mode. You can draw your own wavetables using the editor. There is a per-oscillator spectral EQ. Plus, a Karplus-Strong pluck mode. And to top it off, inter-oscillator FM and RM expand the sonic capabilities. Expanse brings modern wavetable synthesis to the Reason rack, pushing the envelope of sound quality and usability. 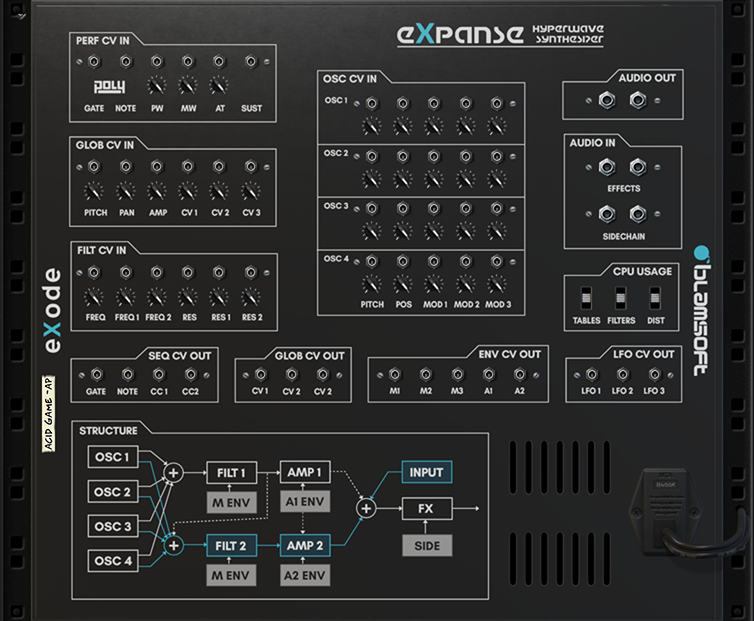 With experimentation quickly turning into epic sounds, soon Expanse will become your go-to synth. Expanse is now available for free trial and purchase in the Propellerhead Shop. Thanks to everyone who participated in the Expanse Song Challenge hosted by Noel G. at ReasonTalk.com. All synth sounds were created using Expanse. Congratulations to the winners!